This is my design card for Penny's challenge 365 - please click on the link to see the lovely crafting by the rest of the team and we hope you will join in our 'anything goes' challenge. I used the lovely Delicious Doodles A slice of cake (they are one of the sponsors of the challenge), colouring digitally in Microsoft Paint. 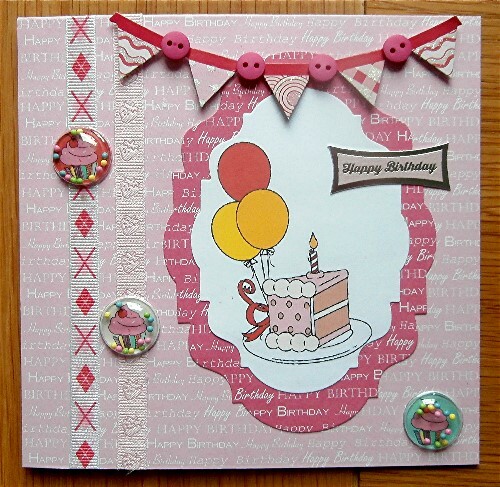 The image was printed and die cut with a todo die, using a larger one to layer with some Kanban birthday sentiment card, using another colour for the background. Ribbons from stash, little cupcake shakers from Paperchase and the banner from Poundland. Always a great idea to have awesome birthday cards like this one in your stash, just ready to go!! Thanks for joining us for our Organization challenge at Cut it Up! Happy Organizing! Lovely card! Thanks for joining us at Die Cut Diva's! Beautifully done, thanks for joining our ATG challenge this week at Digi Choosday. Great card. Who wouldn't want a piece of cake? So glad you joined us at Die Cut Divas. Pretty card! Thanks for joining us at Country View Challenges. Your card is super! Such a lovely design. Your little shaker brads are fantastic!! Thanks for joining us at Digi Choosday ! The little shakers are a nice touch. Thank you for joining in the QKR Stampede challenge. Great card Hazel loving the buttons on the banner and thanks for joining us at Crafty Catz this week good luck and hope to see you again very soon. Lovely card!!! Thank you for joining the January challenge of the Country View Challenges! What a lovely card as always Hazel. :D Really like the banner you created and the little image looks yummy. lol Thanks for joining us at Intaas challenge Do something digital. Great card Hazel, I love the buttons and banner! Good to see you at 613 Avenue Create. What a wonderful Birthday card for our "Birthday Balloon" Challenge @ Little Red Wagon this week - it fits perfect. Thanks for joining us and i hope to see you back again soon ! Thank you for joining our “Anything Goes” Challenge this week at Die Cuttin’ Divas. Beautiful and festive card! Thank you for sharing it with us at Creative Moments. Hope to see you again next time. Beautifully done, lovely cupcake shakers! 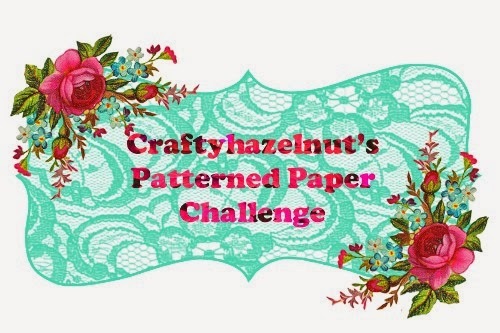 Thanks for playing with us at Through The Craftroom Door ATG Challenge! Looking forward to seeing you again next time and good luck! Darling birthday card! Always good to have a bunch on hand. Thanks for joining Cut It Up this week for our "Organization" challenge! Hello… Thanks for joining the ‘Anything Goes’ challenge at Crafty Friends with your lovely card. Hello Again Hazel... thanks for sharing your card at Scribbles Designs, it fits perfectly with our 5th Birthday Party Blowout Challenge theme.